The Florida Gators came so close to taking down one of the juggernauts of college basketball in a home matchup with Michigan State on Saturday, and yet it still felt so far. 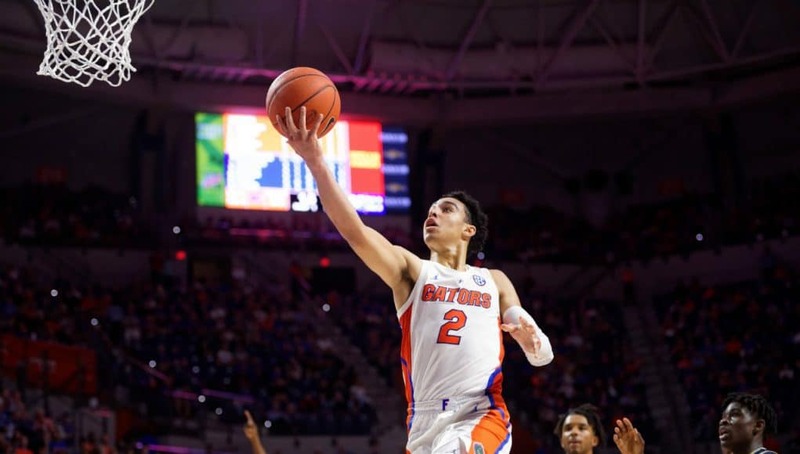 The 63-59 loss to the 10th ranked team in the country was enough to spark some hope in the Florida faithful for the future of this team, but following the game, head coach Mike White seemed as frustrated as he’s been following a game all season. Things couldn’t have started any better for the Gators as KeVaughn Allen hit a quick jumper within the first four seconds of play, Kevarrius Hayes went up for a block on MSU’s Nick Ward, got a steal on the Spartans’ next possession and then Allen drained a three. That series of plays gave Florida a 5-0 lead within the first minute, and one of the offensive players it really needed to step up was feeling it early. The Gators had everything going right from the jump, but the momentum ended very abruptly. Florida proceeded to go on a drought of eight minutes without a field goal as it missed 11 in a row. The great start from Allen didn’t translate to the rest of the team, with players putting up off-balanced and misguided shots throughout that stretch. Somehow, the Spartans still only led 14-7 despite a very bad few minutes for the home team. Keith Stone finally ended the drought with a three-pointer, but MSU’s inside game took over once again for six straight points and a 10-point lead. Deaundrae Ballard and Keyontae Johnson made some big offensive plays to cut the deficit back to five, and then Andrew Nembhard came up with a steal and finished with a beautiful layup, making it a three-point game. It seemed every time Florida knocked on the door, the Spartans had an answer. It was 28-25 with 3:24 left in the first half, but within a matter of a couple minutes, MSU had it back to a comfortable 10-point advantage. The Spartans ultimately took a 35-27 lead to the locker room. It felt like MSU probably should have been up even more, but 11 turnovers in the first half were huge in keeping things close. The Gators let Ward take right back over at the start of the second half. After he made a pair of easy layups in less than a minute and a half, White called a timeout to express his frustration with his team’s lack of intensity. Whatever he said in the timeout, it got his players’ attention, because Florida went on to score the next eight points of the game to make it 39-35. From there, the Spartans were able to hold the Gators down and just out of striking distance until about the seven-minute mark. That’s when Nembhard hit a floater and Hayes made a free throw after the following possession to bring it to a one-score game. After an MSU jumper, Hayes completed a three-point play to put Florida in its best position to take the lead since the start of the game. The Gators were down 52-50 with 4:56 on the clock and the crowd going insane. Again, just when things seemed to be going back in Florida’s favor, the Spartans stretched their lead back to six. Allen hit a three-pointer out of timeout with 3:24 to go, but MSU’s Kyle Ahrens answered right back with one of his own. From that point, it became the Nembhard and Ahrens show. Whoever could outdo the other would come out on top. Nembhard drove in for a layup to make it 59-55, and Ahrens did the same thing on the other end. Stone helped out the effort with a jumper to make it a four-point difference again. After getting a stop on defense, Nembhard made another clutch drive to the basket at the 1:21 mark, making it 61-59. MSU turned it over on its offensive possession, giving the Gators their best shot to tie it or take a lead, but Allen couldn’t get his layup to go. The Spartans got the ball back, Florida’s defense forced a loose ball but ultimately couldn’t come up with it as it ended up in the hands of Ahrens with the shot clock winding down, and he slammed it in for the final dagger just before it expired. That made it a two-possession game once more with just 8 seconds on the clock. It was too little, too late for the Gators to come back with any more answers as they fell 63-59. In the end, the thing that left White the most baffled was Florida’s inability to come up with that final loose ball and several others throughout the game. After several days of what White called “horrific” practices and less than stellar energy until the final 15 or so minutes of the game, he just can’t wrap his head around the problem with this team. It shouldn’t have taken that long to get excited for the opportunity to play a Top 10 team in the country, but it did. On the bright side, the Gators were great on the offensive glass as they came up with 16 for 14 second chance points. Florida also held MSU’s sixth-ranked offense to 24 points below its season average. At the same time, White does not feel the defense played anywhere near the level it did against West Virginia earlier in the week. Nembhard was absolutely outstanding for the Gators once again. He did not put up his typical assist numbers, but he tied with Allen to lead the team with 13 points. He put the team on his shoulders in the final minutes of the game as a freshman, and while Florida came up just short, the effort he gave was impressive. Aside from Nembhard and Allen, not much can be said for the rest of Florida’s offensive performance. With a 10-day break standing between the Gators and their next game against Mercer, White plans to continue to reevaluate as much as he can from an offensive standpoint, and said he is open to changes in both lineups and minutes. While Florida is not over the moon about this loss and knows there is plenty that could have been executed better, it still hung around with one of the best teams in college basketball and may be able to build off that.